Hey! Guess what! I'm still alive! Not only am I still alive, but I have fantastic news. 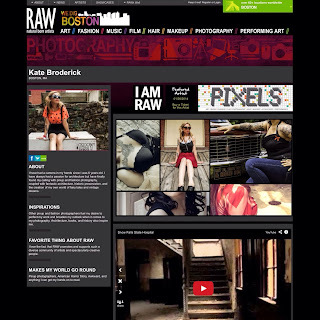 My photography will be featured at RAW Boston's upcoming show on January 26 at Rumor in Boston. Click on the flyer below to visit my profile page and purchase tickets. Even if you can't physically make it, a ticket purchase will support my show and defray the cost of the venue. Otherwise, come hang out with us, meet some amazing people, and see some amazing art! As usual I apologize for the radio silence. It's been a crazy year so far but tonight my post is not about me (insert snarky comment here). Tonight my post is on behalf of a former classmate and friend, Shauna Hadden. Every day we see scam emails and Facebook posts declaring that you or one of your loved ones has been robbed in a foreign country. The scams then go on to request that money be wired to an account to secure your release. Generally you receive a phone call from a loved one who sees this message and you all have a great laugh when you realize that you were not indeed in Beirut on vacation, but slaving away at your desk the whole time. You change your password and call it a day. 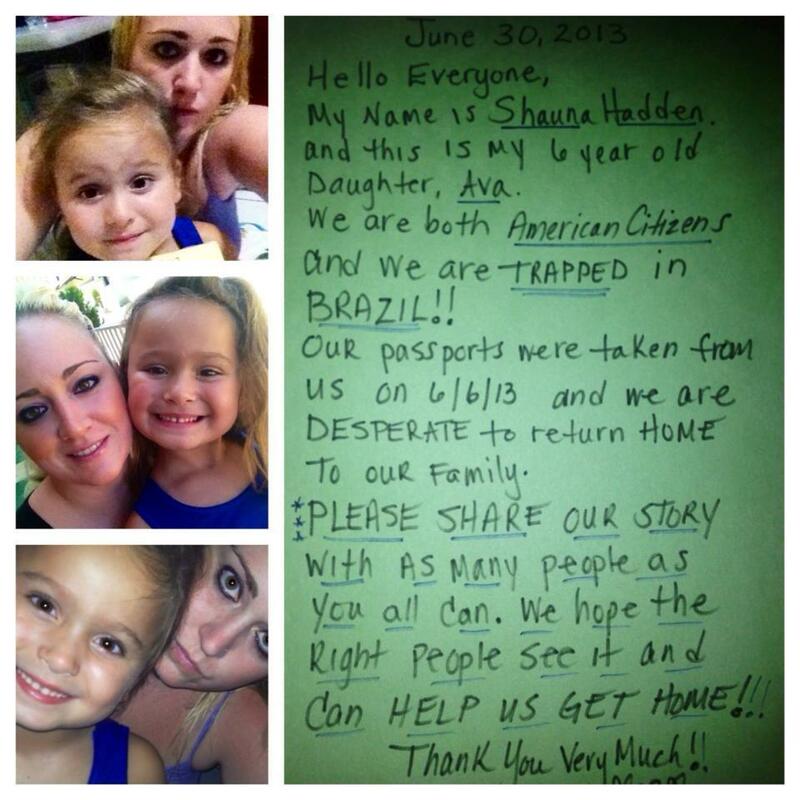 Unfortunately for Shauna and her 6-year-old daughter Ava, this is no scam. In 2005, Shauna's now ex-husband came to the United States illegally and settled in Massachusetts where the pair met and were married; Shauna welcomed Ava into the world two years later. By the time their daughter was just 3 years old, Shauna and her husband divorced and he was summarily deported. Fast forward to May 21, 2013. Nearly four years after her divorce, Shauna has taken Ava to visit her father in Brazil, a good faith arrangement made to give her daughter the opportunity to get to know her estranged father. The moment Shauna stepped off the plane she discovered her good will had been a tragic error in judgment and she is now begging anyone who will listen to help her and Ava get home. Shauna's ex, Donizete, immediately began threatening his ex-wife and child. Shauna did the only thing she could and asked a friend to help her put some distance between herself and her ex, but on June 6th, five federal police officers ordered Shauna to surrender her passport, as well as that of her daughter. Their names were flagged on all airlines and Shauna has been threatened with prison should she attempt to leave the country. 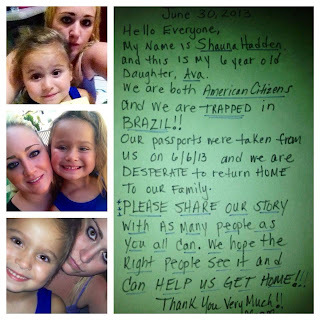 It has been over a month since Shauna arrived in Brazil. Though she is a United States citizen, the country of Brazil has blithely stripped her of her rights and has informed her that she will most likely be an unwilling guest of their country for some time. Though she has tried her best to work through the appropriate channels, Shauna is being told there is nothing that can be done to bring her and Ava home. I know you, my audience, have been faithful readers of this blog for many years and I hope that you take the time to not only read this post but share it in as many outlets as possible, especially those of you who are actual citizens of Brazil. Perhaps you have some insight that might help Shauna and her daughter come home to all of us who miss them very much and are gravely worried for their safety. Thank you all! So my Kickstarter campaign seems to have stalled a bit. So near yet so far away! Would you all take a moment to visit and take a look? Even if you can only spare a dollar every little bit helps to get this project off the ground. Or if you find you can't squeak out a donation, share the link with your friends. Support the arts and history at the same time! It's true. I really am still alive. And guess what else is live....my Kickstarter project! That's right, that's where I have been, busily creating my next work of genius. Check it out here and donate. Even if it's only $1. If every one of you donates a buck, I can get the history of one of the most interesting buildings in the state of Massachusetts finally assembled and printed. And yes, there's something in it for you. You get your name in the book! The more you donate, the more cool stuff you get! Like a signed copy of the finished book, signed photos, maybe even a chance to accompany me to the building for some publicity photos! So please, check it out and back it. Support the arts and history!